So, I'm up to around 250 pipes at this point. I don't prescribe to one type of pipe over another necessarily. I have large pipes, small pipes, straight pipes and bent pipes. I have English pipes, Canadian pipes, German pipes, French pipes, etc. I'm just curious why French pipes seem less collected than many of their counterparts. I have French factory pipes that are great! Tonight, I Was smoking this little Pierre Morel pipe that is a beauty. Yet, nobody mentions much about French pipes. Thoughts? Interesting. It really does seem that way. Yet, BC, Ropp, and Chacom seem to have a good following. So I can't answer why they're not talked about more. I wouldn't mind having a pipe from any of the manufactures I listed. In fact, a Vintage Ropp is on my wishlist. I just never pull the trigger because there are pipes from other makers I prefer for the same money. Funny you should mention this. I was wondering the same thing. When I go on smoking pipes website looking at estate pipe I never look at French or German estate pipes. American is first then English followed by Italian, Danish then Irish. Sometimes misc rarely German but Never French. I’ve only ever had 1 Chacom it was a beauty of a small bent apple that I gave my father after he dropped his pipe in a lake up north. With the makeshift repair band he put on it, it sank to the bottom. My first pipe ( 1980s vintage ), a P.Viou. Long story short - removed stinger, broke stem at tenon, Norwoods fixed her up as a nosewarmer. And the rest, as they say, is history. I had never really thought about it before, but yes, french pipes on average seem to command less value both in price and collectable desire, but my only experience with them have been a trio of nearly identical horn stemmed Ropp's that SP marketed as having been found in an old storage Warehouse...I bought one each for my father, my brother, and myself, we have a pipe every time I am in town, I am a fan of them and would decidedly be open to further purchases of pipes made by french companies or artisans. I have 2 BC's and a Jobey Stromboli. All three are great smokers. Old man Comoy's first name wasn't Jack, it was Pierre. 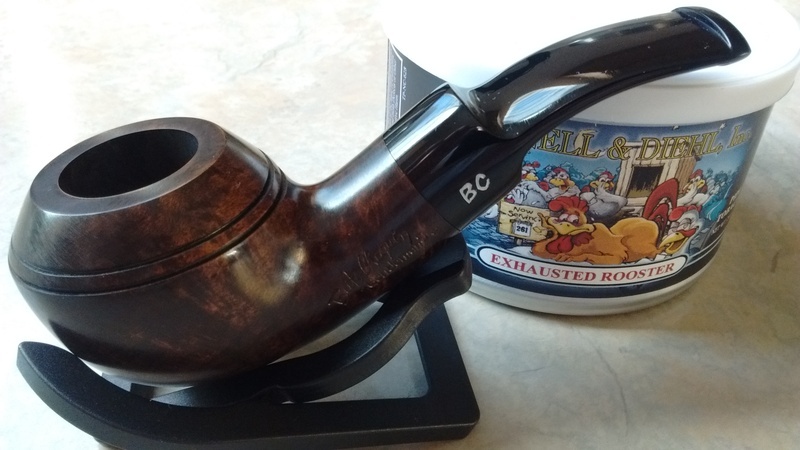 France has a huge part in briar pipe history, for sure. Part of the reason French pipes don't get as much attention is just that there aren't any real fancy-pants French makers. There's no French Castello or Dunhill. And I'm sure there are some great French artisans, but I can't name one off the top of my head. Also, I'm not sure how much of a factor this really is, but over the last few decades a ton of true basket pipes have been stamped made in France. The really garbage ones, ya know? England has cranked out loads of no-name pipes, and I've had quite a few. On average (IMO), even the no-name English pipes are usually waaaay better than the clunky gurgling wood-putty filled French monsters that you'll still see for $15 down at the local cigarette outlet. I wonder if that (maybe subconsciously) hurts the cred of all French pipes for a lot of guys. Also, I think it's fair to say that in the past there have been certain shaping trends. The classic English shapes are crisp, balanced, just pipey as hell, fantastic. What I would call French styling has been at times... A little rounder in the wrong places, proportioned oddly in ways you can't put your finger on, just kind of off somehow. That said, there are lots of great French pipes out there. I think Chacoms have been excellent value factory pipes for a long time. A guy can still get really good deals on Chacom estates and a nice little collection could be built for small bucks. BCs and Ropps I don't have much experience with, but some folks like them a lot. And I've never even heard of Pierre Morel... Maybe part of the issue is that some of the better French factory pipes stayed on the continent and never made it to UK/USA? I dunno. No doubt -- Chacom is "Chapuis-Comoy" ! It ain't an accident! Part of the reason French pipes don't get as much attention is just that there aren't any real fancy-pants French makers. There's no French Castello or Dunhill. The French "Dunhill" was "Dunhill." Dunhill Paris made extraordinarily fine pipes in Paris. In part, they wished to avoid French import duties. In part, they catered to French tastes. Who's to say what is what? But, the French mode of luxury pipes largely disappeared after the war. I've never seen a Parisian-made pipe post-1945, and I doubt I ever will. Post-war, the only French pipemakers were in St Claude. Some were quite fine, others mediocre, but all were detached from Parisian luxury. Also, I'm not sure how much of a factor this really is, but over the last few decades a ton of true basket pipes have been stamped made in France. The really garbage ones, ya know? Virtually every pipemaker in France was consolidated into Cuty-Fort Enterprises in the 1980s, as the industry shrank. England has cranked out loads of no-name pipes, and I've had quite a few. On average (IMO), even the no-name English pipes are usually waaaay better than the clunky gurgling wood-putty filled French monsters that you'll still see for $15 down at the local cigarette outlet. I wonder if that (maybe subconsciously) hurts the cred of all French pipes for a lot of guys. Almost every pipemaker in England was consolidated into Cadogan's single "Orlik" plant in the 1980s, turning out, largely, well, crap. But there are, today, several firms cutting their own way in British briar. Are we to mark every "Made in England" pipe by late-1980s Cadogan standards? Or should we judge them all by the standards of the 1960s, in which there were many firms all turning out a high standard of product? Suffice it to say, there is more to a pipe than its country-of-manufacture stamp. Maybe part of the issue is that some of the better French factory pipes stayed on the continent and never made it to UK/USA? production matches the european market much more than the US market. If you do google "maitre pipier" you'll be surprised how many artisan pipe makers there are in france. I had a Butz Choquin and a Ropp that both smoked fine. The Bruno Nuttens I had was a great pipe. @tfdickson has a couple of his too. I have two Edwards that are made from Algerian Briar and were produced in St. Claude. They are good smokers. I also had a Longchamps that was made in France. In my opinion, the French pipe carvers just concentrated on making factory pipes and never really produced top of the line pipes stamped "Made in France." I forgot about the Nuttens being French. Great pipe that it is. I purchased a couple of the Ropp Algerian briar pipes smokingpipes.com introduced a couple of years ago and they were okay but have since been passed on to someone who enjoys them more than I did. They were nice pipes, well made and nicely finished. It's like a smooth modernized Custombilt. That Ropp is still going strong. Great pipe @WalkinStick . Neither are exceptionally fancy, however, both are good smokers that didn't break the bank. Both "workhorse" pipes ... What more is there to say ?? ?